- Rain and more rain! Here in Carolina, PR we had nice weather for most of the day. 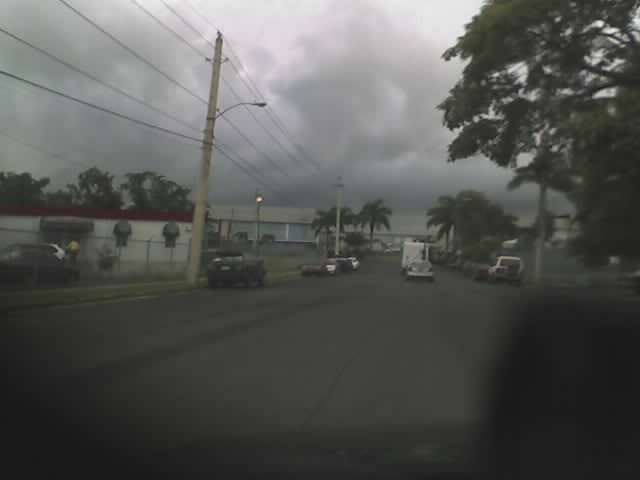 At about 3 pm some noticeable cloudiness appeared but practically no rain. About that time the situation on the rest of the island was quite different. 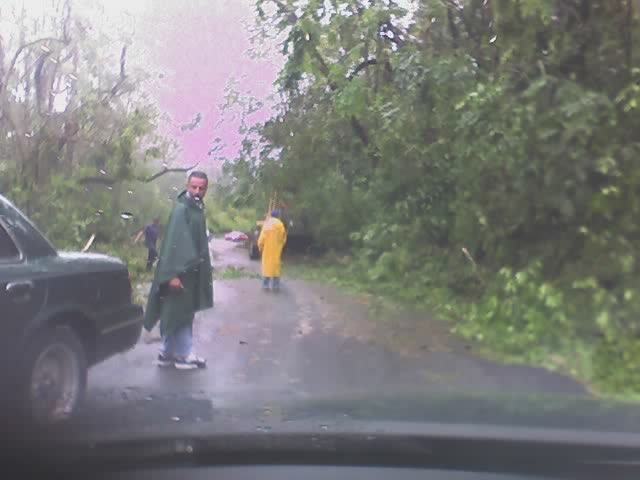 A tornado over water was reported around the town of Manatí in the central north coast. A little after sunset, rain started. At about 8 pm we had strong showers. Really heavy showers wich continued till about midnigh. Hell broke loose in SJU! Spooky Halloween day! 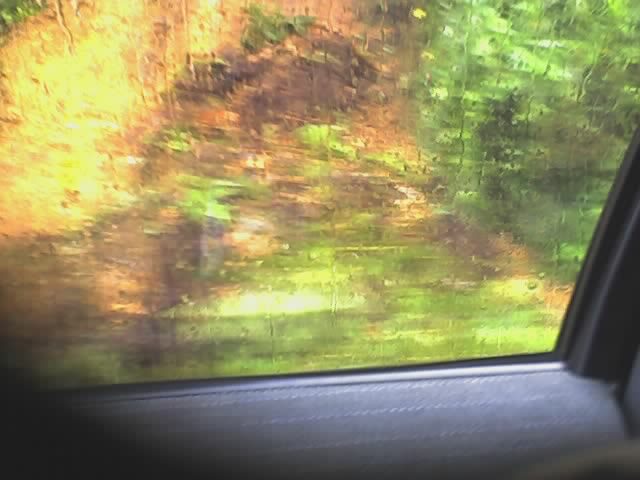 2 much rain on the road...Thunders n Lightning at night . Oh...some kids on Treak or Trick! Boo!!! 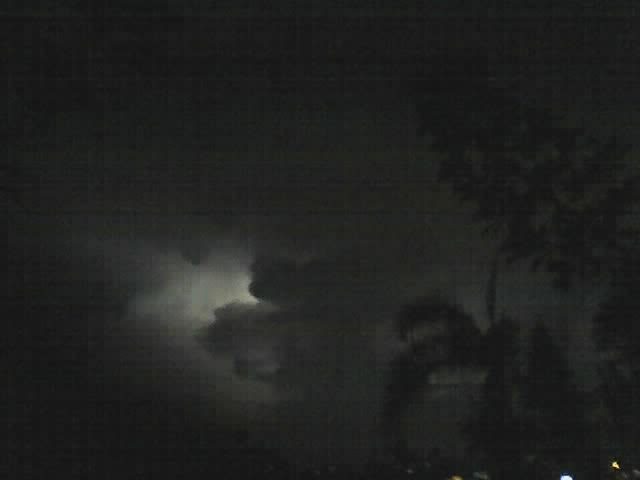 Thunder n Lightning plus heavy rain. around 66 *F. A nice Mother Nature show. A bit delayed, (I was without power and water until late Saturday) I was able to retrieve and put together the Doppler images, from San Juan, as animations; as Jeanne was within the Doppler’s range. I’ve divided them into 6 and 12 hour sets, for those with dial-up connections. Jeanne’s eye can be clearly seen, as she approaches the British and US Virgin Islands, goes past our sister islands, Vieques and Culebra; before making landfall on Puerto Rico’s SE coast. Jeanne then crosses Puerto Rico, exiting on the NW coast. As Jeanne crosses the Mona Passage, making landfall in the Dominican Republic, rain bands over central Puerto Rico are clearly visible. The images are in 143 and 286 mile range. It’s one thing to have gone through one of these things, and quite another to see the images, to grasp it’s dimensions. les envio una peliculita de Jeanne. las planchas de zinc y los arboles son los actores pricipales. una tormenta o huracan no lo son sin plachas de zinc y arboles volando o a punto de salir volando. ya para algunas areas de carolina hay luz y agua. en algunas areas solo hat agua pero se espera que la luz se restablezca hoy. ayer por la noche llego la luz para aca para villa carolina 3 y en la madrugada de hoy llego el agua. nos estamos recuperando. pense que esto en vez de ser tormenta fue un huracan por lo menos cat 1 por que para aca soplo en cantidad. tengo que admitirlo, pense que jeanne no nos afectaria, pero uno nunca sabe con los huracanes y lo que traen. en mi casa no puse las tormeteras, solo asegure las plantas y cogi agua por que ya tenia provisiones de frances e ivan. no fue hasta que espezaron a soplar los viento y la lluvia fuerte y el agua se metia por las ranuras de las ventanas. mi esposo y yo salimos en medio de la ventolera ha poner las tormenteras y subir las cortinas de lona... y lo mejor que hicimos... valio la pena por que el viento y la lluvia apretaron. no falto la gente en la calle, en carro a pie, en motora... la policia se mantuvo dando rondas y llamandole la atencion a cuanta persona en la calle. hubo una calma, el ojo del huracan, en eso funcionarios de la ofic para el manejo de emegencias empezaron a notificarles a los residentes de las villas(villa justicia, esperanza) que la represa carraizo habia abierto las cuatro compuertas y que el rio grande de loiza estaba fuera de su cauce, que buscaran refugio en las respectivas escuelas/refugios. la noche fue larga, mucha lluvia, sin luz, sin agua, solo un radio oyendo las noticias y las historias de la gente. al otro dia se veian brigadas del municipio recogiendo basura y arboles. la policia vigilante todo el tiempo. fue una buena experiencia por que no importa la magnitud, sea tormeta o huracan, lo importante es sobrevivir, recuperarse y seguir pa' lante. TS Jeanne at full load! From Guayama, Puerto Rico. Electricity returned for times in this area. On the island 90% without electric power. 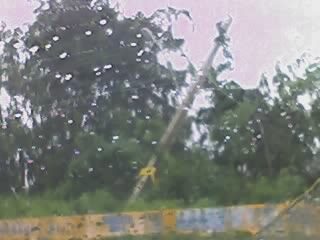 Power grid collapsed because an order from the governor to cut power without checking first with personnel in charge of grid. 53% without water. Of the 79 municipalities that compose the island more than 50 asking to be declared disaster area. Right now its raining. Specting 2" in during the day since 16th more than 4" have been recorded. 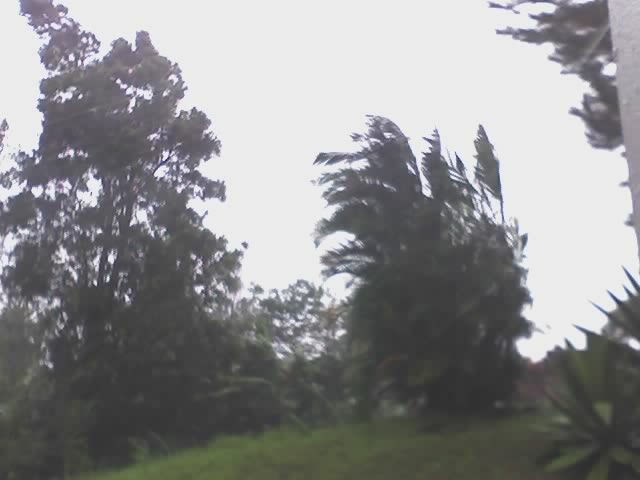 My system recoded 999 mb at the moment of landfall "eye" passed 5 miles aprox. from home. Aprox. 2,000 people in shelters this morning. We survive and we will do it again. the way. 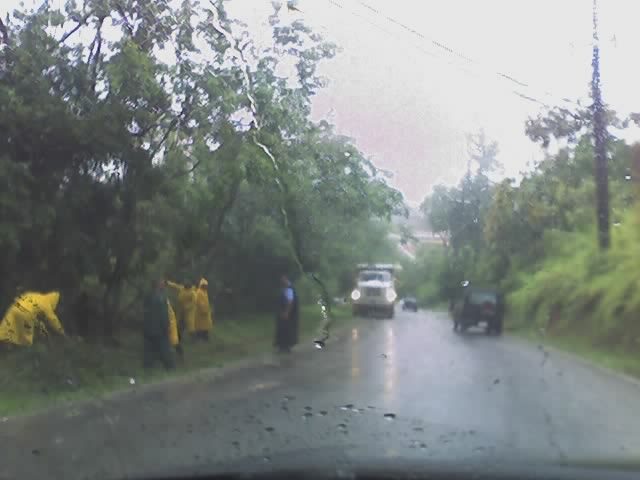 Mudslides, road blocked, powerlines  down. 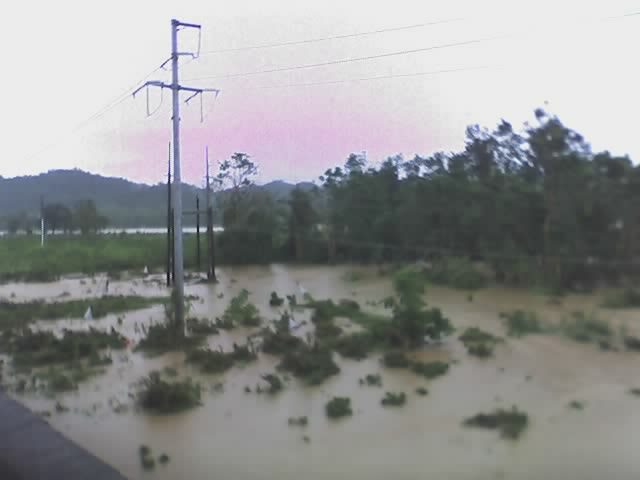 Aftermath of TS Jeanne. 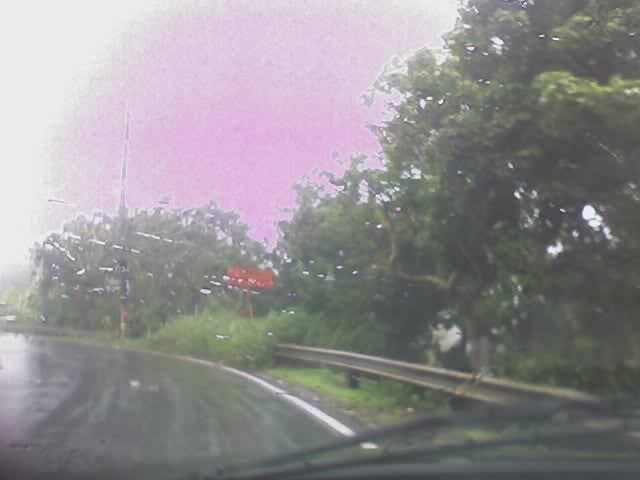 Photos from Barranquitas area. Gusts  around 80 mph ! no kidding! Rain like hell! 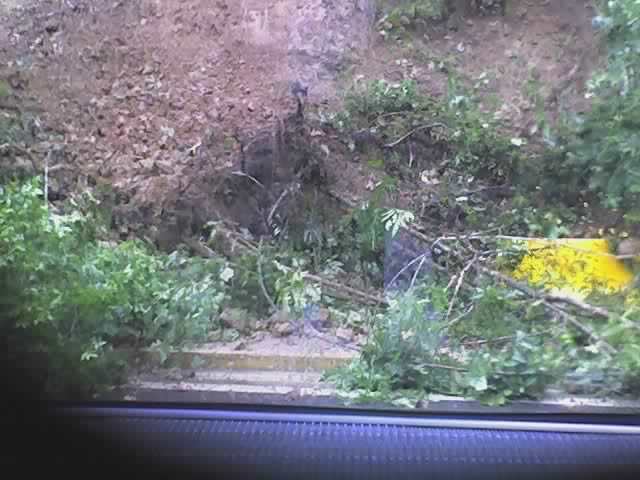 Many trees down. Rivers overload! Very fortunate here in Cabo Rojo. Just over 2.25" of rain, gusts under 29mph. No flooding. Pretty much back to normal. Not much to say about damage in the metropolitan area; San Juan, Rio Piedras, Santurce, Carolina. Power and water service to be restored soon. Hospitals are ok. Main strees are ok, police all over the intersections giving traffic control. 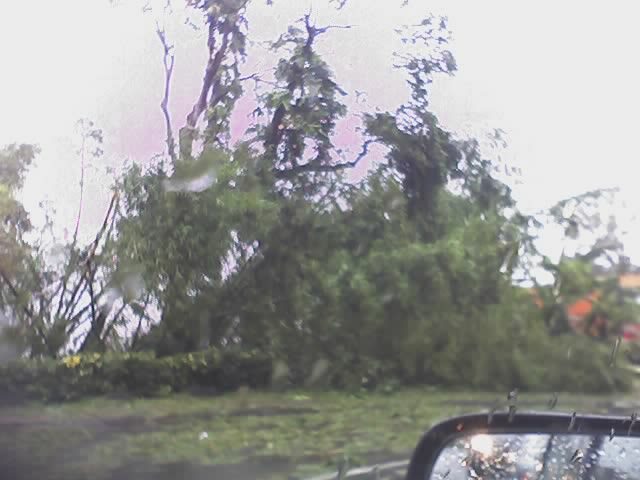 Just a few trees, debress and stuff all over the roads, some few blockades. Some flooding in certain areas already marked as is. There is an estimate of 4000 refugees. Apparently 3 dead as of today and a few other injured. Some schools resuming clases on friday 17, others on monday 20. Most banks are open and private agencies. Most government employees and universities to resume on Monday too. although not torrential as has been reported in other parts of the island. just as it enters the Atlantic. woman's roof was blown off and she unfortunately died when it fell on her. check on the boat in the marina and the beach house in Islote. We have to keep an eye on the strong wave in the eastern Atlantic. Ahora si... mucho viento y lluvia para esta area, pero sin ninguna emergencia. La policia se ha mantenido dando rondas y el personal de ornato del Municipio se ha mantenido limpiando las alcantarillas inundandas por basura. 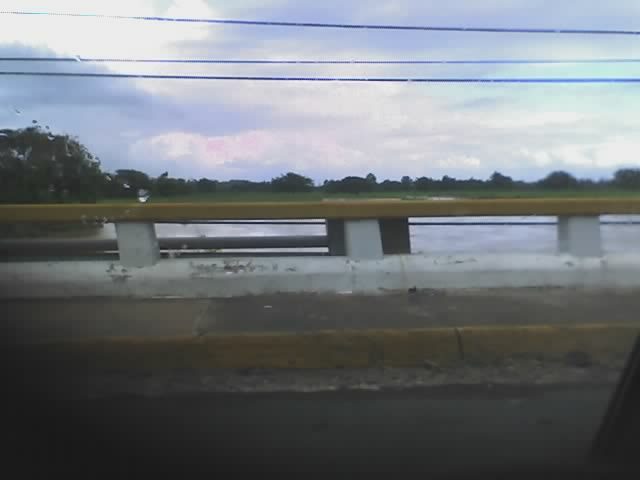 Hasta el momento no han tenido que desalojar a nadie por esta area ya que el Rio Grande de Loiza pasa cerca cuando se sale de su cauce pero al parecer todo esta tranquilo. Pendiente a las noticias y a storm carib. 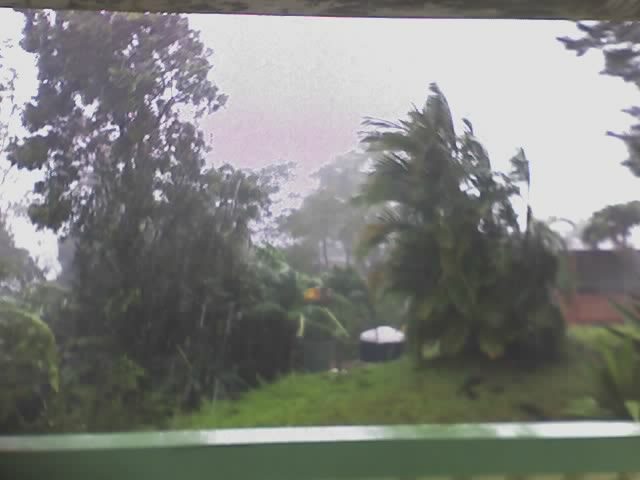 Here in Guayama are waiting for Jeanne landfall. It's going to be between here and Patillas. 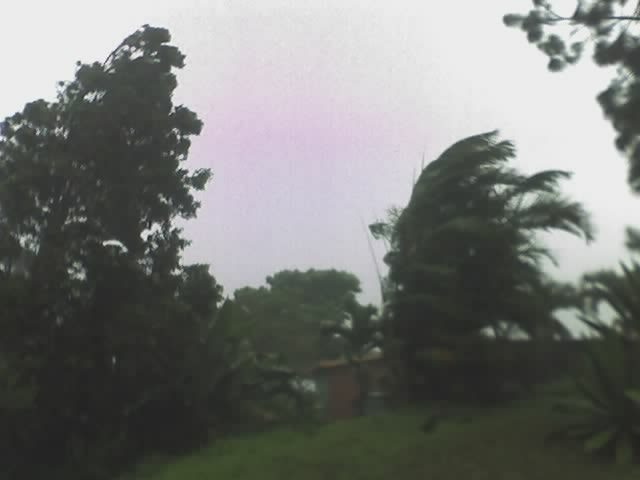 At 8:00 a.m. (1200 UTC) pressure 1009 mb and falling, 80.4 F, relative humidity 74%. 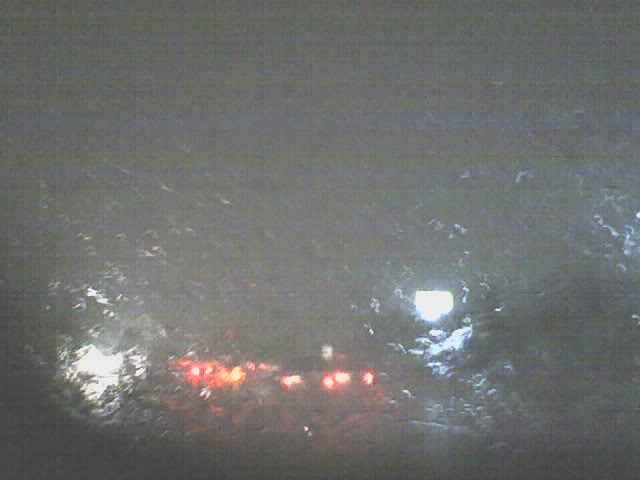 rain subsides but the wind gusts 25MPH are causing problems with electricity. Shelters are open but they are empty. too many false alarms I guess. 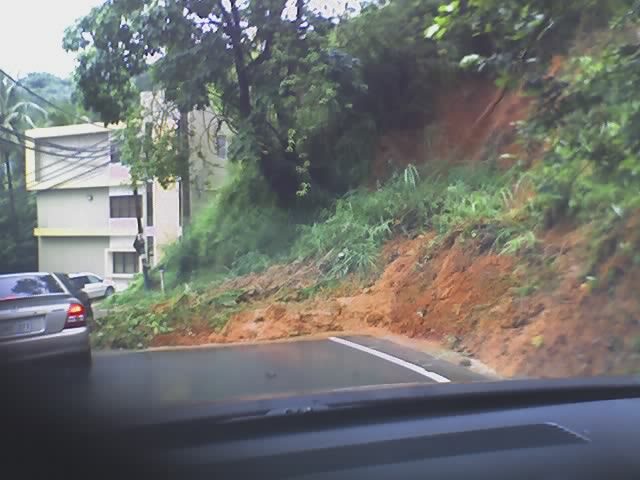 Road 167 on the mountains in Orocovis is closed because of damage from landslides. hoping for the best. Mucho viento, poca lluvia pero bien nublado para Carolina a esta hora. Segun las noticias Jeanne entrara por el area de Guayama a eso de las 10:00 de la ma�ana de hoy. Se espera tambien que se fortalezca ya que su paso es lento, lo que indica que se esta organizando. Sus vientos continuan a 60 millas por hora. Se ha emitido un aviso de inundaciones repentinas para el este de Puerto Rico. El aviso de huracan continua para toda la isla. 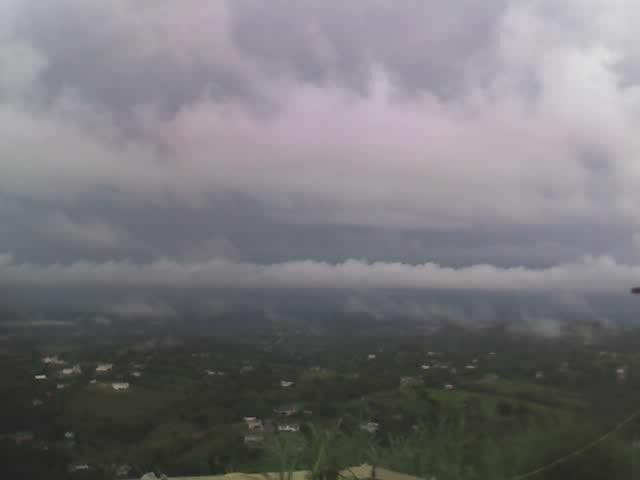 1st rain band dropped 1.50" of rain around 2:30 this afternoon in Cabo Rojo, in the SW part of PR. Peak wind was 14 mph Stars are out tonight. rains on the mountains area as told by friends . More info 2morrow morning. Hi, I am in Condado about 200meters from the coast and its a very quiet evening right now. So far Jeanne isnt much and its weird but the storm is 40miles se of St. Croix but the pressure at St. Croix airport is at 1012mb and winds 14mph! basically less than the typical tradewinds. Here in the San Juan area its dry with close to calm winds. There was some rain at around 6pm but its been nice and dry since. The front half of the system is very very weak maybe the back end will bring some rain and some just above typical tradewinds in the 30-35mph range. I suspect once the sun comes up tomorrow it will trigger very heavy rain around the island. The media of course is overplaying the situation and i havent heard one reporter mention the current calm conditions in st croix! So far not really worth putting up a wood panel or anything. Most houses here are made of reinforced concrete walls and ceiling and some concrete block walls. 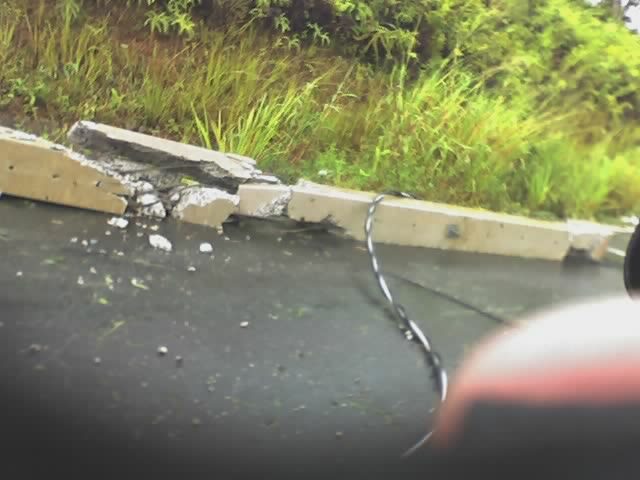 So it takes a LOT of heavy wind in the 70-100mph+ range to cause some damage. Hola, I live in Rincon on the western tip of Puerto Rico about 15 miles northwest of Mayaguez. The information we get here always pertains to San Juan and we are a 3 hour drive away from there. The PR networks are saying that Tropical Storm Jeanne will be arriving here tonight, whereas your "how close is it"site tells us, it will be in Mayaguez in 17 hours. I think I will wait till morning before I put up my hurricane shutters. Anyway a lot of people are preparing and the stores are packed. The newly formed Jeanne is heading this way 16.6 N, 63.1W movement wnw 12 MPH. At 11:30 a.m. (1530 UTC) my instruments read 1012 mb falling, 85.6 F, 81% relative humidity, no rain and hazy wish all us good luck. will keep informed regularly as I can. I’ve put together a series of Ivan satellite animations and photographs. In addition to the Atlantic GOES and Floater series, I’ve added the GOES-12 images, which are just south of Cuba. I’ve also discovered a Cuban satellite, which I’ve integrated. Cuban Doppler, as well as AccuWeather Florida satellite and Key West Doppler animations will be added, as circumstances develop. Considering that Ivan has 155 mph winds and barometric pressure of 918 mb (27.11”), the eye is clearly visible. Whew! 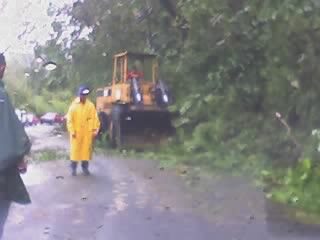 we were saved from Ivan Because a Low Pressure System in our area. 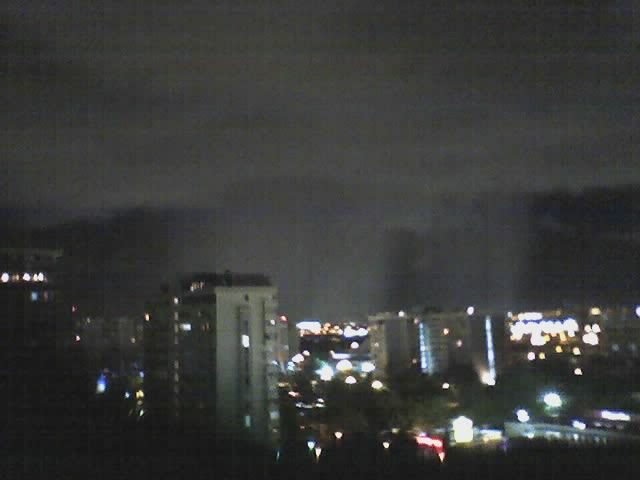 But Yesterday night we have some bad tunderstorms and thunderclaps on our area. Today in Carolina and San Juan was sunny, very HOT and humid. The night looks clear and the temperature is still high because we have heat index in the lower 100. I hope the areas affected by Ivan restablish soon. Additional updates, will be available late tonight, or at dawn tomorrow. If the animations are too large for �dial-up connections, please let me know, and I will alter them and take that into consideration for future animations. Let me take the chance to agree with Dave’s editorial. I’d use different reasons, being Puerto Rican. As far as I’m concerned, people in the Caribbean, have forgotten more about tropical systems, than the Weather Channel will ever learn. 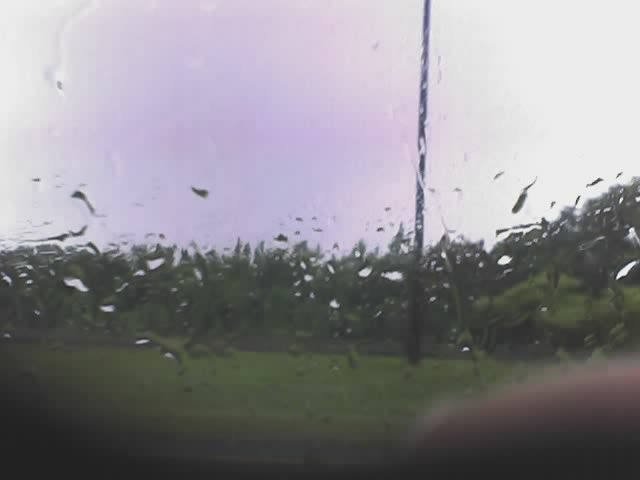 I could care less, to watch some half-baked moron, standing out in the rain with a 60 mph wind. They’ll be pulling that stunt, until someone’s head get ripped off, by flying debris, on live TV. All of our eyes now watching tropical storm Ivan. Very far from the islands but models predict in some way a near hit to Puerto Rico in Wensday to Thursday. I will keep you informed. En Carolina esta nublado y ventoso. Temprano en la ma�ana llovio un poco pero en estos momentos hace un poco de sol. La gente por aca se esta preparando, limpia alcantarillas, los patios, haciendo compra y por todos lados se oyen radios y televisores en las noticias. Al parecer Frances nos dejara lluvia y un poco de viento, su impacto no sera directo pero de todos modos debemos prepararnos. Durante la temporada de huracanes no se puede uno dejar llevar como el cuento del lobo que simpre se anunciaba y no venia. Hay que preprarse por que vale mas precaber que remediar. We seem to be in the proverbial calm before the storm. Not that pass noon, conditions should start to get messy. Public employees have been given the day off, as well as some private enterprises. Due to this, and that schools have been closed, there’s very little traffic. About the only thing I can report is that there seems to be less breeze. I plan to prepare a set with Doppler images. Expecting rain to begin this afternoon. The north coast will be hardest hit with predicted waves at 15 to 20 feet. Coastal flooding eminent as well as small stream flooding inland. 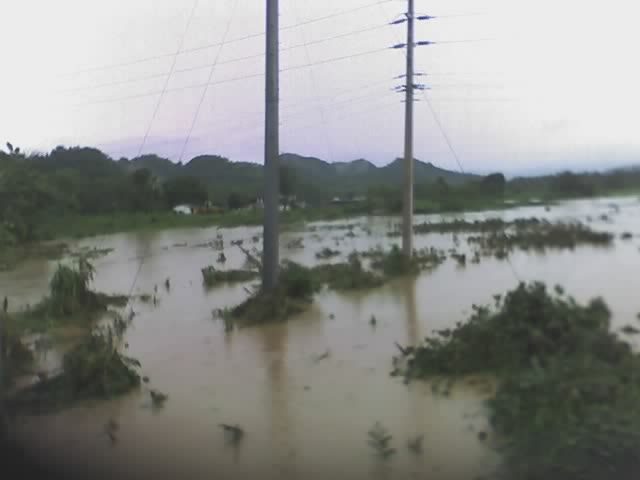 Ground is already saturated in many areas of the west and NW part of the island from recent heavy rains. Rain will be the greatest hazard. Assume power will be turned off Tuesday evening. Storm center forecast to pass 120 miles to north and tropical storm winds extend 115 mile from center. 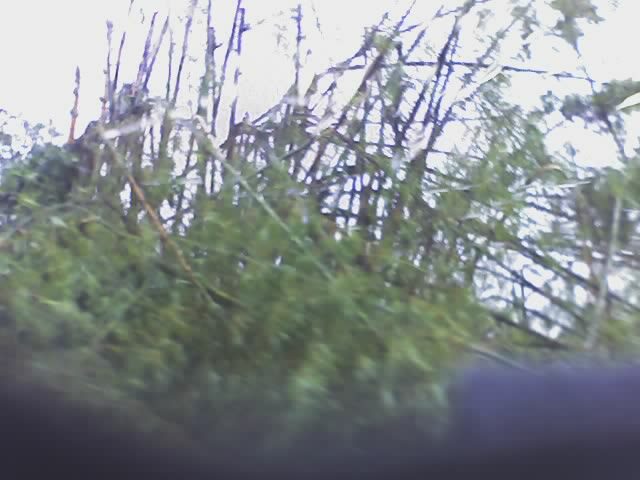 Putting new back-up battery in Weather Station, generator, still and video cameras are ready for action. Flood gates are ready at the doors and all rain spouts are cleared. 15 foot waves are expected, which should be somewhat spectacular, at a safe distance. Bottom line, I'm seeing a trend of� more models coming into agreement with a continued lower latitude westward track for Frances. If this verifies, then any low pressure weakness that “may” be left behind by Hurricane Gaston (yes, it was a hurricane when it came ashore in S.C.) and future T.S. Hermine could not pull Frances NW-N east of Florida and/or the T & K and Bahama Islands. Or said another way, a Category 3-4 monster doesn’t have to deviate too much, to make us feel full-fledged +40 mph winds. My gut feeling, is that tomorrow morning’s advisory will put us out of out misery, wondering what awaits. The edge of tropical storm winds to Puerto Rico’s north coast, gets closer and closer. This am’s forecast discussion from San Juan WB, warns that significant changes in Frances’ path, will affect local conditions. Was that this year’s understatement? All in all, local conditions are unchanged, as Frances’ eye is forecast to be 210 miles just east of north (17�) from San Juan, on Tuesday morning. So far, I’ll keep my traditional storm chicken, for the pre-Francis “asopao” in the freezer. I’ve prepared this storm’s crop of animations, and will update them, as the satellite follows Frances. 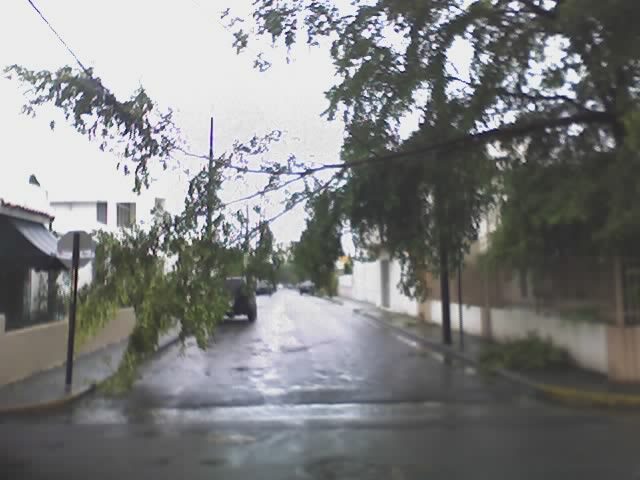 Desde Carolina PR, hoy 4 de agosto de 2004. 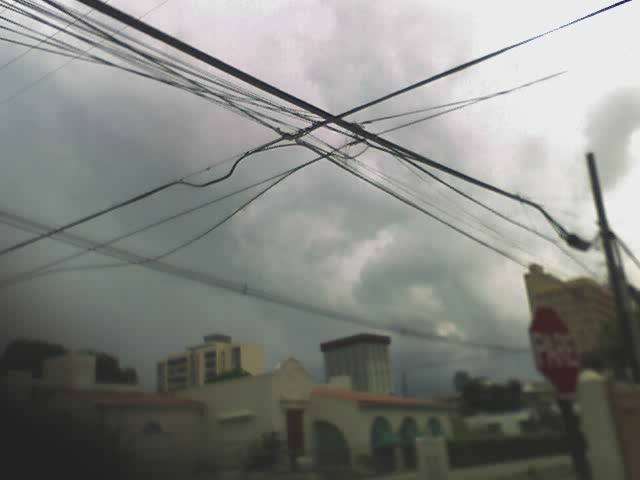 5:45 pm hizo como que iba ha caer un diluvio, mucho viento, el cielo bien nublado. 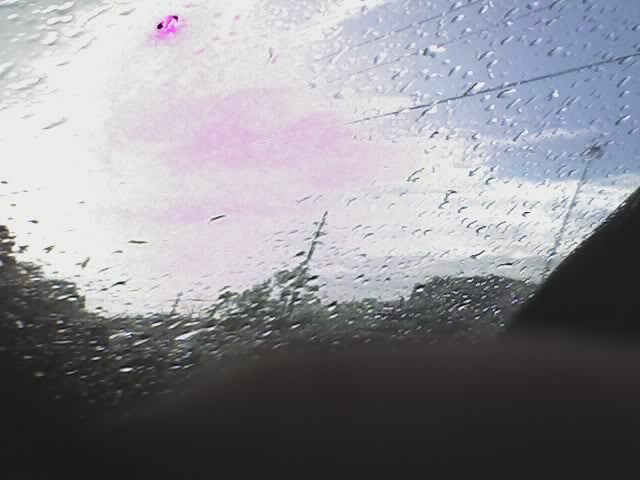 Empezo a llover con viento, fue una mini tormeta que duro como cinco minutos. Paro de llover y empezo a despejarse el cielo. 6:30 de la tarde, muchas nubes en el cielo, el sol brillando y ventoso. 7:00 de la noche, muchas nubes anaranjadas, azules, rosadas y violetas. Ventoso y probabilidad de que para esta noche y ma�ana llueva. Atento a las condiciones del tiempo. Cuidense mucho. THAT TROPICAL STORM CONDITIONS ARE POSSIBLE WITHIN 36 HOURS OR LESS. THIS STATEMENT RECOMMENDS ACTIONS TO BE TAKEN BY RESIDENTS AND VISITORS OF THE U.S. VIRGIN ISLANDS AND PUERTO RICO. AT 800 AM AST...THE POORLY ORGANIZED CENTER OF TROPICAL DEPRESSION NUMBER TWO WAS LOCATED ABOUT 440 MILES SOUTH SOUTHEAST OF SAN JUAN. U.S. VIRGIN ISLANDS SHOULD PLAN TO RETURN TO SAFE HARBOR BEFORE NOON ON WEDNESDAY AND REMAIN IN PORT THROUGH THURSDAY EVENING. MORNING HOURS OF THURSDAY...WITH PERIODS OF HEAVY RAINFALL POSSIBLY LINGERING INTO THURSDAY NIGHT OR FRIDAY MORNING. 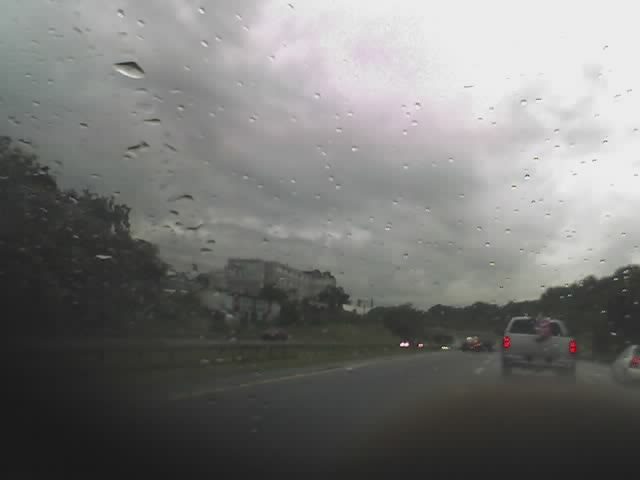 en carolina es estos momentos esta bien nublado y lloviendo un poco. 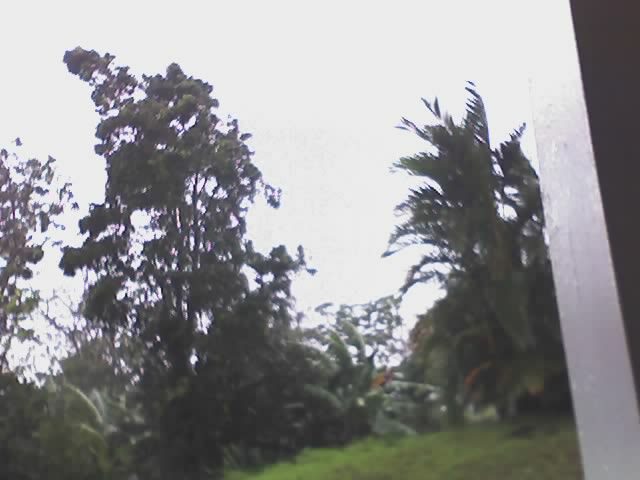 hoy estuve en fajardo, en la ma�ana mucho viento y nublado, el mar estaba pica'o (me quede vestida y alborota por que ni a la piscina me pude meter) ya para el mediodia empezo a llover con viento, a eso de las dos paro de llover y salio un poco el sol , pero una vez salimos de fajardo y llegamos a rio grande, como eso de las tres, empezo a llover nuevamente. una vez llegamos a carolina escampo. pendiente a las condiciones del tiempo por que al parecer esto seguira en la noche y probablemente ma�ana. cuidado en la carretera, pista mojada. 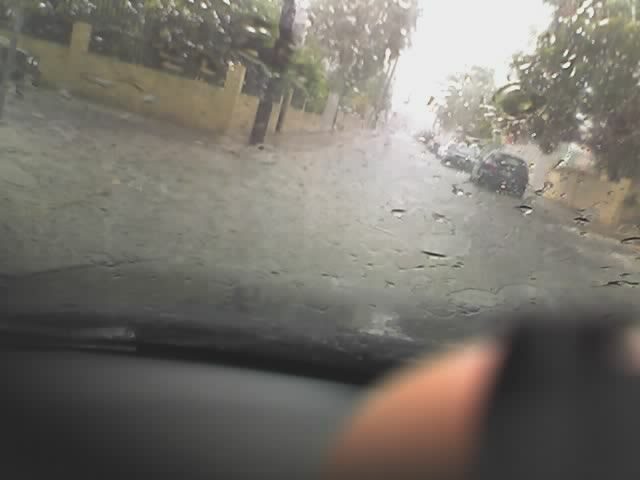 Mucha lluvia para esta �rea, no se desde que hora, pero lo que si se es que para R�o Piedras empez� como a eso de las 4:30 justo a la hora de salida (menos mal que ya me hab�a montado en la guagua). Debo suponer que para ac� empez� a llover mucho antes por que estaba toda la 65 de infanter�a inundada empezando desde el Escorial y todo ese tramo hasta la salida de Plaza Carolina. Ahora mismo esta despejado, no esta lloviendo pero hay muchas nubes. Sombrilla en mano por si acaso. HOLA, and a warm welcome back !! to all Hurricane Correspondents. I've just arrived last week from a well deserved vacation in the Caribbean. The skin color I acquired reveals at bare sight that the sun has been up and extremely powerful, being as brilliant as it can be. Although this relatively dry weather will come to an end, as a series of waves move across the area during the early part of the week. Our local area will begin to experience the effects of the 1st tropical wave reaching East of PR by Tuesday. Thus it will only serve to modestly increase moisture ...The expectations of the next tropical wave will bring more moisture, instability and enhancement of activity across the local area. I suggest you gear up-pack your umbrellas and rain jackets this coming week as it seems to be a wet one!! 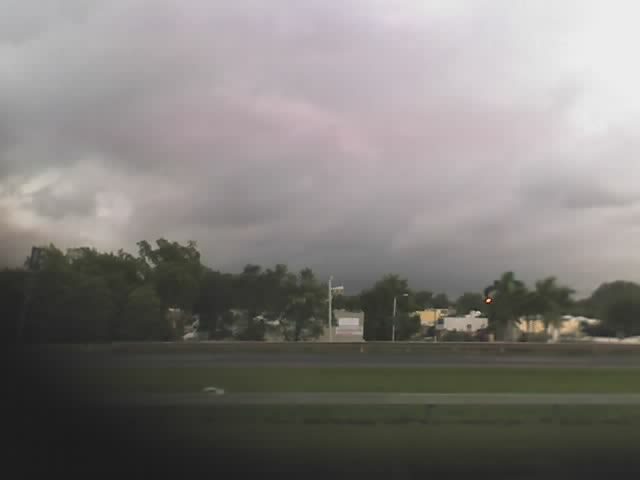 Today's forecast 07/18/2004 in my area shows scattered showers with a chance of precipitation of 40%. Partly cloudy, with a high near 88. Heat index values as high as 99. East wind between 13 and 15 mph with rainfall amounts between a tenth and quarter of an inch possible. Lets see what happens. Everything weather-wise seems to be under control and well balanced. As I've mentioned in the past, our island is a blessed one. Counting on those blessing for this years Hurricane Season, that just began last month and still has a long way to go through November. Friendly Reminder to all...Sunshine is delicious, rain is refreshing, wind braces us up, snow is exhilarating; there is really no such thing as bad weather, only different kinds of good weather. 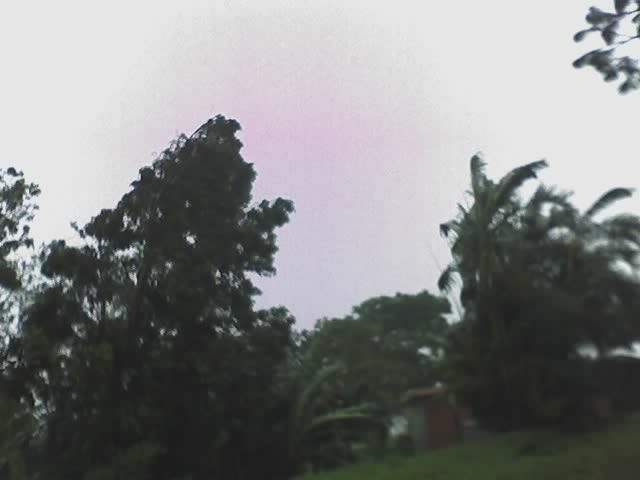 mucha lluvia, truenos y viento para el area de carolina. desde las 2 de la tarde esta lloviendo esporadicamente para esta area pero no fue hasta ahora que cayo un aguacero. parece que seguira asi toda la noche por lo que les recomiendo una buena pelicula y pop corn, chocolate con queso mmm o lo que se les ocurra para pasarla bien. 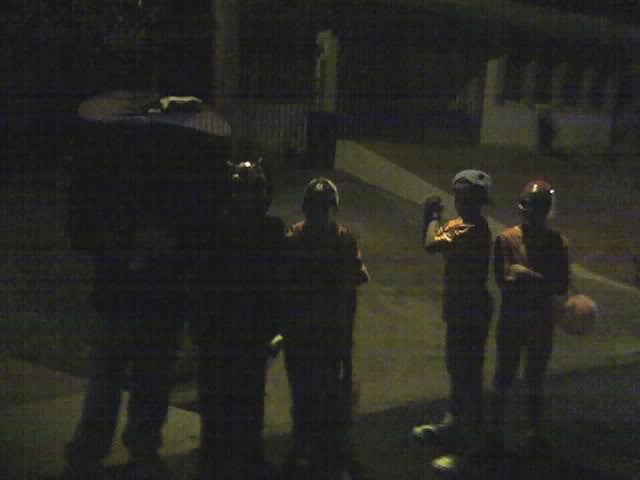 asi que sombrilla en mano y precaucion en la calle que la pista esta mojada. 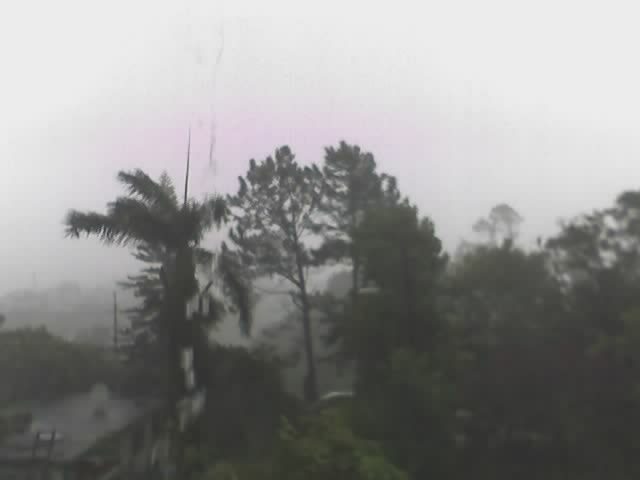 Mucha lluvia para el area de Carolina. Hasta la tortolita que tengo en patio se mojo. Al parecer seguira asi toda la noche y parte del dia de ma�ana debido a una onda tropical que esta pasando al sur de la isla y sus bandas de lluvia se expande hacia el norte. 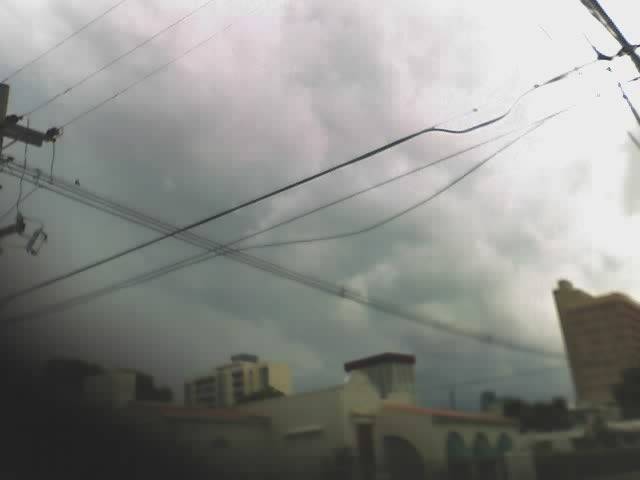 Mayaguez and Aguadilla due to daily thunderstorms. Hola mi nombre es Elena y desde Carolina, Puerto Rico les estare informando sobre las condiciones del tiempo durante la temporada de huracanes que empieza ma�ana 1 de junio. Desde mi pueblo de gigantes y con mi asistente Barto, les enviare fotos tomadas desde el techo de mi casa de donde se pueden apreciar vistas del sur y oeste del pueblo e inevitablemente de mi vecindario. Esta temporada esta pronosticada como una de mucha actividad asi que estaremos en contacto.